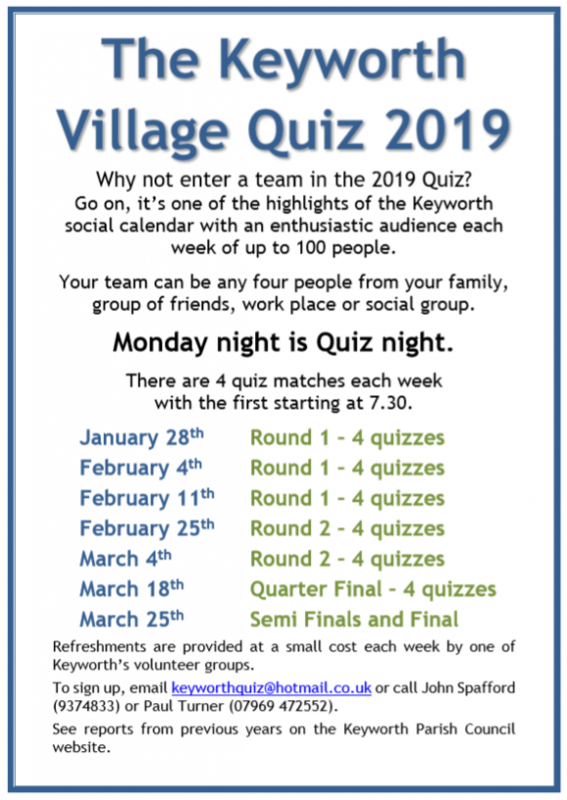 The Keyworth Village Quiz ended after 7 evenings and 27 quiz matches with a 62-59 victory by Willow Brook School over the Keyworth Allotments in front of an enthralled audience at the Village Hall. Willow Brook now join the Twinning Association on four wins each since the Quiz was begun by Derek Oakley back in 1976. The audience's favourite question for the night: What is usually the main ingredient of the cocktail named after Soviet foreign minister Vyacheslav Molotov? See below for the answer. In the semi-finals Willow Brook had a very close victory over the British Geological Survey and the Allotments had a resounding 75-37 win over the U3A Pals. The final featured rounds on Keyworth Street Names, a picture round of local villages, a Mastermind round and 40 bell and buzzer questions. Our surprise round this year featured Bill Cooper singing out-takes from songs from six musicals for the teams to recognise. He was accompanied by Claire Bonney on keyboard. The winners received the Oakley Cup and individual prizes were presented to both teams by Bill who expressed gratitude on behalf of the audience for the professional organisation of the whole seven-week event. Thanks go to quiz organisers Paul Turner and John Spafford, scorers Anne Bellamy, Kath Oakley and Pat Jackson, and technical expert Chris Terrell-Nield. Over £400 has been raised during the Quiz for the seven village charity groups who serve the refreshments to the 800+ people who attended the 2019 quiz run. See keyworth-quiz.html or look us up on Facebook for details of the Quiz and how to enter a team for 2020. The answer to the question above was neither vodka or gin but petrol (or any flammable liquid). Monday 18th March was Quarter Finals night at the with four close matches as the remaining teams looked to the semi-finals and final on the 25th March. The Allotments faced the Labour Party and in the early rounds the sides were almost equal. The Allotments extended their small lead with a strong B & B round to reach their fourth semi-final in the last six years. Keyworth Primary School scored poorly in their two individual rounds and despite beating BGS in the B & Bs were still beaten by 53-33. In the all-school match Willow Brook chalked up a victory over South Wolds Staff by 53-39 despite the Staff drawing the B & B round. The final match of the night saw the U3A Pals progress to their fifth semi-final in the last seven years in the highest scoring match of the night, a 60-49 victory over the Scouts Turkey Trotters. Please bring a pen to take part in the Audience Quiz with the chance of winning an Easter Egg. Click here for results to date. fantastic scoring by BGS and the Medical Practice. The first match was close fought throughout with the Medical Practice keeping up with BGS in the first three rounds. However, the BGS turbo buzzer performance in the B & B won the match. I can't ever remember a 50-point maximum score in the B & B round – well done these two teams! Match two had Willow Brook and the Friends of Kadzinuni in contention up until the B & Bs. Willow Brook's well-known buzzer prowess was once again on show and they moved ahead to win by 62-33. The closest match of the night saw the South Wolds Staff hold on to beat the Methodist Church. The Church were catching up in the B & Bs but ran out of time. The Staff now face Willow Brook School in the Quarter Finals. The final match was very tight throughout and with U3A giving away several points in the B & B by buzzing in incorrectly the Scouts remained in with a chance until late on. The U3A now face the other Scout team from the Turkey Trotters in the Quarter Finals. Thanks to the Keyworth Rainbows for providing the refreshments. The four evenly matched quarter final ties take place on Monday 18th March starting at 7.30pm. Week 4 was the first week of the Second Round matches and saw the 2018 champions from Keyworth Dramatic Society beaten by the Labour Party. Keyworth Primary School had a bye in the First Round so this was their first appearance in the 2019 competition. Probus once again provided a real test but the second highest scoring match this year ended with a 67-46 win for the School. The Guitar Club, without captain Brian Lund, were still very strong in the B & B coming back from a thirteen point deficit to within one point of the Scouts Turkey Trotters but losing by 49-50. The next match between the Dramatic Society and the Labour Party was almost as close with the Labour Party holding on by answering the last question correctly to triumph by 47-45. In the final match between the Allotments and Abundance, billed as a match of organic proportions, it was the Allotments who planted themselves into the Quarter Finals with a 66-46 win. The third week of the Quiz saw the final matches of the First Round and another audience of over 105 coming to enjoy the competition. In the first match the Keyworth Medical Practice and Baptist Church fought out a close scoring tie with the KMP holding on through the B & Bs to go through as the lowest scoring winners in the First Round by 43-36. The Rugby Club were unfortunate to face last year's winners the Dramatic Society who were once again in good form and won 51-37. Keyworth United and the Scouts Turkey Trotters were level with five B & B questions to go but the Trotters answered them all correctly to go through by 52-42. The final match of the night was the closest of the entire first round with Abundance just pipping the Scouts Uniformed Branch by 53-49. However, that score of 49 meant that the Scouts go through as one of the three highest scoring losers. The other two highest scoring losers were the Friends of Kadzinuni, who also scored 49 points but lost by a higher margin than the Scouts, and Probus with 48. The Second Round matches take place on the 25th February and 4th March, both evenings starting at 7.30pm. Week 2 of the Quiz saw one of the highest scores of recent years as the Guitar Club amassed 77 points. Our refreshments were provided by the Keyworth Brownies. The first match was the highest scoring of the Quiz so far this year with an aggregate score of 118. The Methodist Church were the winners with 70 but the Probus team did well in the B & B to score 48 and have a chance of progressing as a highest runner-up. Match 2 saw the Guitar Club beat the Tennis Club fairly easily with the decisive round being the B & B where they scored 37-2 as Tennis gave away several points by jumping in too early. A new team for 2018 were the Taverners led by Rich Cooper, former Quiz Master of the Keyworth Tavern Quiz Night. The team performed well but despite winning the B & B round they were beaten by the always competitive 2017 winners South Wolds Staff. Our final match was a close one with the scores going in to the B & B round at 31-30 with Willow Brook School only one point ahead of the U3A Too team. Even half way through the B & Bs the scores were equal, but Willow Brook's experience told and they were 57-43 winners. The opening night of the 2019 Quiz was attended by one of our largest ever audiences with over 110 people there before the refreshment break. As usual, they were treated to some exciting matches. 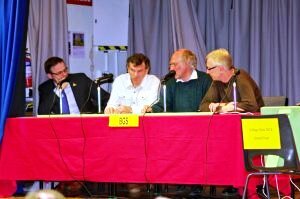 The Quiz was opened by Brian Lund who has a long involvement in the Quiz as a contestant, winner and as Quiz master. Thanks to Brian. The opening match saw 8-times Quiz winners BGS beat Crossdale who missed their captain and Bell and Buzzer expert Mr McKenna. A Dad's Army round proved troublesome for the younger team from Crossdale after they stormed the Islands of the British Isles first round. The U3A Pals were on typical B & B form taking 26 of the 50 points to go from a one-point lead to a final 11-point winning margin against the Friends of Kadzinuni. The Friends look in a strong position for one of the three highest runners up spots with their 49-point losing score. The South Wolds Sixth Form Students are always popular with the audience and this year was no different with Ed, Harry, Verity and Ben only 5 points behind the Allotments after the first three rounds. They beat the Allotments on the round about the 2010s. The B & B round is an Allotments specialism though and they ran out 51 -38 winners. The final match between the Labour Party and the Parish Church was very equal until the B & B round and even then, very close, until the last few questions. The Labour team finally got into their stride to pull away for a 59-47 win. Will 47 be enough for the Parish Church to get a runners-up spot in Round 2? We recommend that the audience come back next week to find out! In the news: In an accident that occurred near Sandringham last week where a Land Rover Freelander overturned, how old was its driver ? Please click here for the Quiz Draw that has taken place. Wondering what you've missed in previous years? XHTML 1.0 validated. WCAG compliant. Page generated in 0.2424 seconds.